At the corner of Rand/Sarratt nearest Alumni Lawn is this shaggy-barked tree. The most distinctive feature of river birch is its peeling bark, which hangs in layers with colors ranging from gray to brown to orange. Rows of dark dots (lenticels) mark the bark layers. The leaves are small and toothed. The fruits are a conelike, dry structure that shatters to release the seeds, leaving a central stalk. 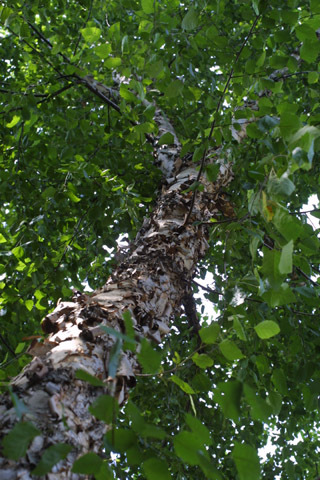 As the name suggests, river birch is found along rivers and streams. It is fairly common and is the only birch you are likely to see in the wild in middle Tennessee. This organism is a living specimen that is part of the  Vanderbilt University Arboretum  with the local identifier 3-300.